Over the next couple of weeks, I thought I’d revisit some music from regions I hadn’t been back to since the early days of the blog. With the spirit of Lydia Mendoza in mind, and after a recent viewing of Chulas Fronteras instigated by my friend Chimatli, I thought I’d spin some more early Tejano music from the Texas-Mexico border. 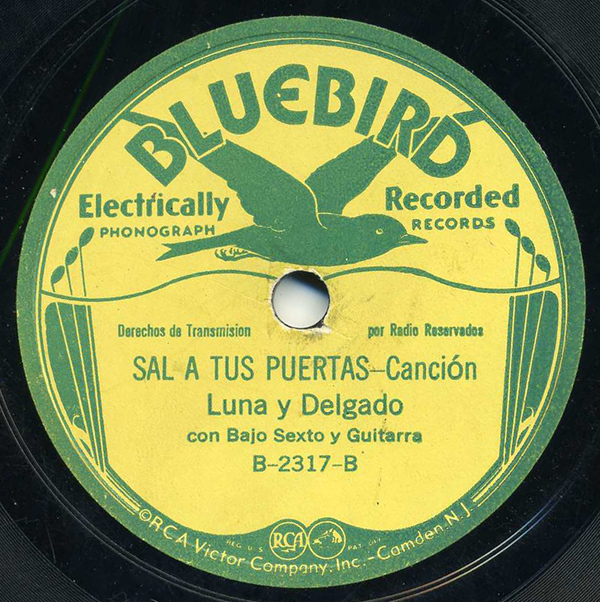 Alejandro Luna and Regino Delgado recorded several sides for Victor’s Depression-era, budget-conscious subsidiary label Bluebird in the mid-1930s, including this one, “Sal A Tus Puertas” (meaning “Come To Your Doors” – thanks, Dax). 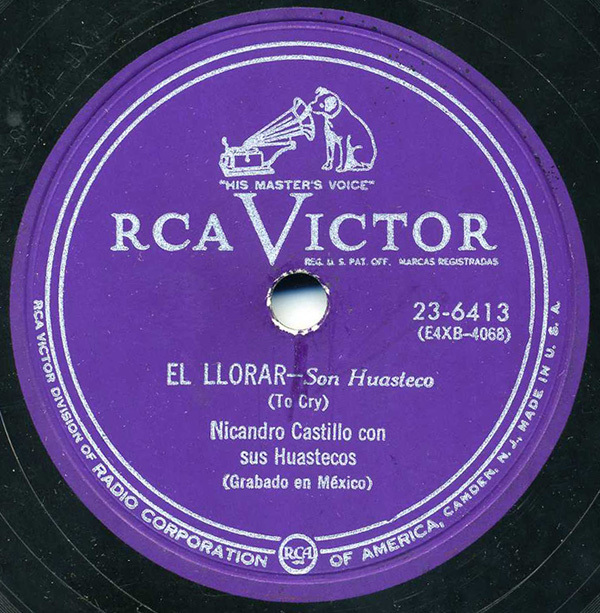 This particular track was recorded at the Texas Hotel in San Antonio on January 25th, 1935, and the duo accompany themselves on guitar and bajo sexto. The Bluebird “ethnic” series began in about 1934 and lasted until 1939, totalling about 1400 records. The recording industry had been crushed by the Depression, but Victor, in large part due to their Bluebird subsidiary (which also released country, blues, jazz and pop), were able to ride out the difficult times. For example, in the late-teens, it was not uncommon for a 78rpm record to cost $1.00, or even $1.25. Very pricey, considering. Well, by the early 30s, with sales in the tank and record companies folding left and right, Bluebird records went on sale for 35 cents. Lidya (commonly known as “Lydia”) was born in 1916 and began singing with her family in the Plaza del Zacate of San Antonio at a young age. 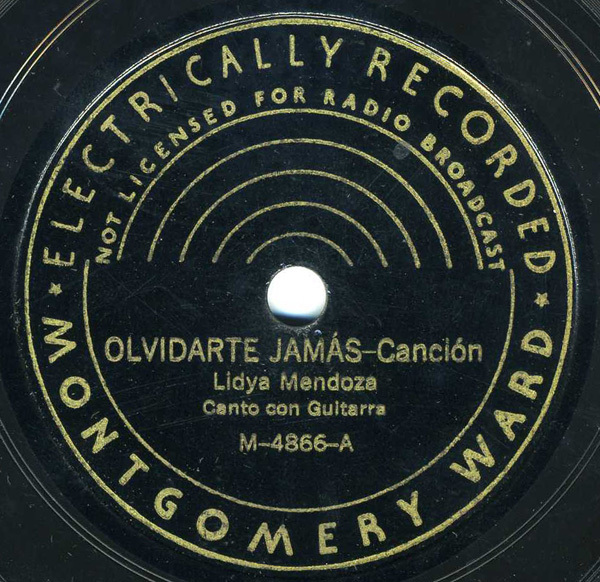 In 1928, the Mendoza Family recorded 10 sides for the Okeh label. However, in the early 1930s, she signed a 10 year contract with the Victor subsidiary Bluebird, and recorded hundreds of tejano classics. 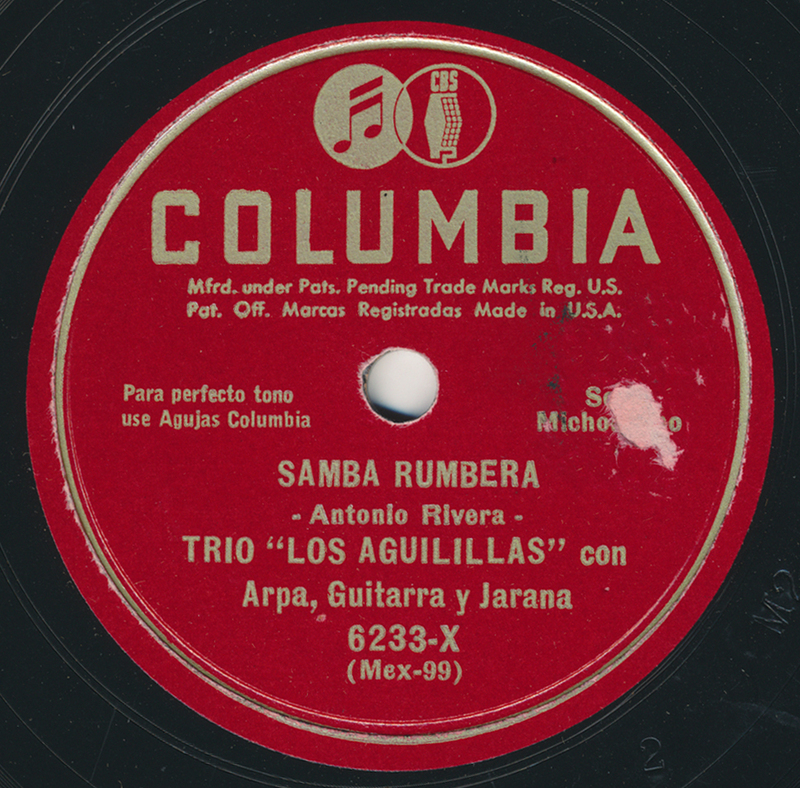 This canción, uncompiled as far as I know, was recorded on August 12th, 1935, in San Antonio’s Texas Hotel. The title translates to “I Will Not Forget You.” Her 78s can be found, but most often in one condition: trashed! They were well loved, and finding a decent copy of any early Mendoza is a good thing. She is a legend, and there’s little else but hyperbole I can add to her biography. For more, go here. Or here. And if you’re interested in music, please go to the Arhoolie label and check out their fine Mendoza releases. As a recent reader noted, Lydia Mendoza passed away on December 20, 2007. The New York Times obit can be read here.